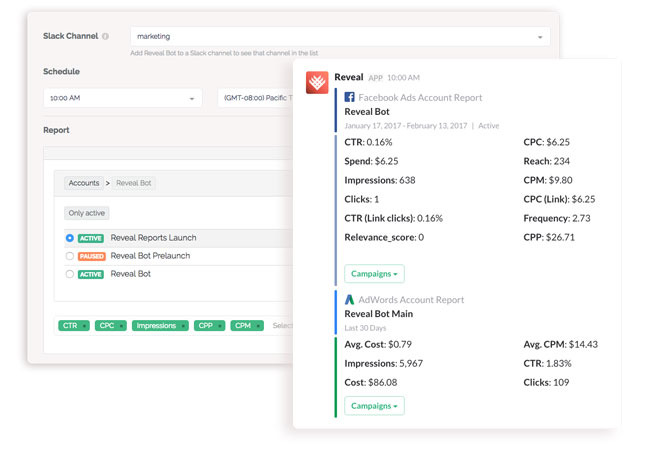 Revealbot helps you create custom ad performance reports for your campaigns, advert sets and ads with any combination of metrics. You can have reports delivered daily, weekly or on a custom schedule. The whole process is pretty straightforward: you construct your custom report on Revealbot's Custom Reports page and then get it in a specified Slack channel or email at a specified time. Pretty self-explanatory. Distinctive name will help you find a certain report in the list of all created reports. Here you pick the channel you want your report to be sent to. You can send it to email, to any Slack channel or direct messages. Set specific time, timezone (comes in handy for international teams) and days of the week you want this report to be sent. Here you pick the item you want the rule to report on: ad account, campaign, advert set or ad. Click Open to get from account to campaign level, from campaign to ad set and then ads. Use the bar on top for a quick search. Next, you select the metrics for a specific period. Once you've clicked the dropdown, you'll see the full list of metrics available. You would also see the metrics from Facebook Pixel if you have it enabled. After choosing the metrics, select a time frame for calculating them, for instance, CPC for the last 7 days, Spend for the past month etc. You can have multiple items in your report, e.g. combine Facebook Ads account with Google AdWords data in one report that you'll see in Slack. To add another layer, click Add Report Item. Once the report is created, you will see it in Slack or email on the time and date you've set. The list of all created reports is available on Reports page. You can also check what reports you have enabled right in Slack by just typing reports.